Brand looks to move pickups even further upscale. 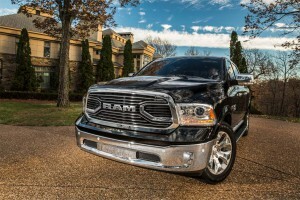 Ram continues to push the boundaries of luxury and comfort in the full-size pickup segment with its new Laramie Limited. Since the end of the recession trucks have emerged as luxury vehicles and American truck makers keep pushing further upscale. As one of the chief beneficiaries of the movement towards more expensive trucks, FCA US, the former Chrysler Group, is pushing its Ram Truck brand to move even further upscale with a special edition of the 2015 Ram Laramie Limited that Ford and General Motors are certain to match. “Among Ram Truck’s greatest strengths is our ability to quickly react to customer demand,” said Bob Hegbloom, president and CEO, Ram Truck Brand — FCA US LLC. “The new Laramie Limited trim is a perfect example of how Ram directly responds to customer input with the highest level of luxury available in pickups. The Laramie Limited trim exceeds the high expectations of affluent truck buyers by combining capability with refinement,” Hegbloom said to reporters prior to the truck’s unveiling during the press preview for the Chicago Auto Show. 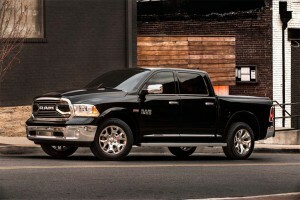 The Laramie Limited trim will be available on the Ram 1500 and the heavy-duty Ram 2500 and Ram 3500. Hegbloom said the latest version of the Laramie Limited features premium materials, such as all-black, full-leather seating, real wood interior trim, once found only on a luxury sedan, and unique badges and a brand new front grille that emphasize Ram name. 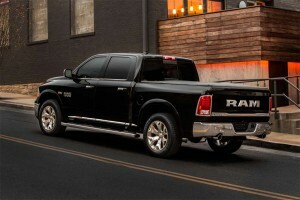 The new Ram Laramie trim will be made available on the Ram 1500 and the heavy-duty Ram 2500 and Ram 3500, Hegbloom said. The Laramie Limited’s all-new grille is the most prominent change of the exterior. As the leading point of the new Limited, its new billet port grille breaks from the traditional a crosshair styling that has been a feature of trucks from Chrysler since the early 1990s. The front is now augmented with bold “RAM” lettering. On each side of the grille, a quad headlamp design includes a bi-functional halogen projector system placed in a dark background. Fifteen amber LEDs illuminate park/turn/position lamps and three amber LEDs serve for the side markers. The Laramie Limited’s all-new grille is the most prominent change of the exterior. The side profile of the Limited comes with chrome accents for body-side molding with etched “Limited” mirrors, door handles, window molding and standard wheel-to-wheel side steps. Ram 1500 Laramie Limited also features all-new 20-inch forged multi-surface aluminum wheels – unique in the truck market and a detail not to be missed. Polished surfaces are accented with painted silver. Heavy Duty models also feature a new multi-surface 20-inch fully polished aluminum, six-spoke wheels. Wheel centers are embossed with the Ram brand name. Matching the new front grille theme, a new tailgate design is fixed with a 20-inch-wide, bright chrome “RAM” badge so onlookers can clearly identify the truck. On the inside, Laramie Limited features an all-black leather cockpit with pinstripe stitching and graystone leather piping to provide additional elements sophistication and style. Rear flap-closure seatback map pockets with modern, chrome Ram-lettered buckles also are unique to Laramie Limited. The Ram Laramie Limited’s double-stacked center console is topped with a forgiving, French-stitched full-leather lid, covering USB, Auxiliary and 12-volt service points. Just forward of the console lid, a new bin houses a cellular phone and tablet holder, which can be concealed with a new tambour wood sliding door. The real wood door is made from Black Argento, the chosen timber for the Limited interior. The collective Silver pinstripe theme runs through the wood and a satin chrome handle rolls the door with ease. The Laramie Limited features the next generation 8.4-inch Uconnect system with standard navigation. Of course, it features the next generation 8.4-inch Uconnect system with standard navigation. Digital background screens are tailor-made to the high-class trim, another detail valued by premium truck customers. The center stack is finished off with K-black Dark Metallic paint, Argento inlays and surrounded by large Liquid Graphite bezels. Ram Laramie Limited 1500 also is equipped with air suspension, wheel-to-wheel side steps, navigational radio, remote start, backup camera, power adjustable pedals with memory, heated seat and steering wheel. $40K-$50K for a pick-up truck makes no sense to me at all. Don’t like the new grille on this model either.